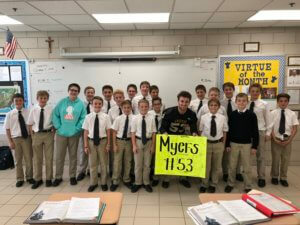 Home / Everest Academy - Everest Collegiate High School - Everest Collegiate High School Sports - Everest Academy Sports - Everest Academy Student Life / Who’s Your Mountaineer? 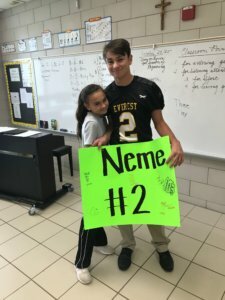 Mountaineer fans are cheering on all of our teams this week as they continue to progress through CHSL play and final competitions! 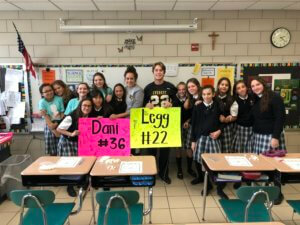 Academy students wanted to encourage the EC varsity sports teams who won their CHSL divisions and are competing for Catholic League championships this week. 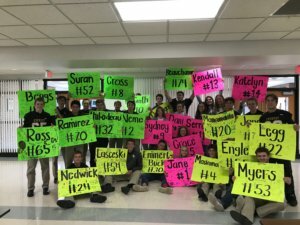 They participated in a school spirit activity called “Who’s Your Mountaineer?” Each class decorated a sign for the football and volleyball players to take along with them to the championship games. 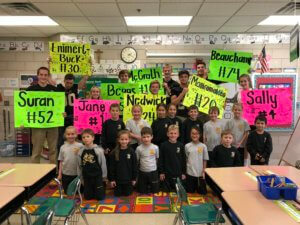 The varsity athletes visited the academy classrooms to thank the students. 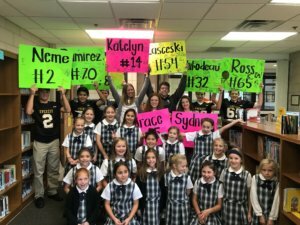 EC football takes on Riverview Gabriel Richard in the Prep Bowl this Saturday, October 20 at Ford Field 4:00 P.M. Go Mountaineers!